The discovery of a Greek dedication to a church, or possibly a monastery, from 1,500 years ago is leading archaeologists to think they may have found the long-lost ruins of Ashdod-Yam, a Byzantine city known in the classical sources as Azotos Paralios. 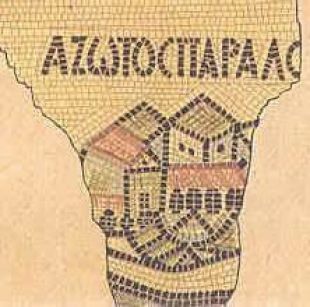 Azotos Paralios was a later expansion of the ancient Roman city of Ashdod-Yam, which had been found on the Israeli coast just a few kilometers from the even older city of Ashdod, and which has been partially excavated. The location and extent of the Byzantine expansion had remained unknown, until now. The almost perfectly preserved dedicatory inscription discovered during the third excavation season most probably belonged to a Georgian church built at the site. Archaeologists believe the rest of the Byzantine city lies beneath the dunes by the modern southern Israeli city of Ashdod. “We know from historical sources and a representation on the Madaba map (a contemporary mosaic map located in Jordan, from the sixth century) that the region's center of gravity shifted from Ashdod to Ashdod-Yam during the Byzantine period," says Dr. Alexander Fantalkin of the Tel Aviv University institute of archaeology, head of the expedition with Prof. Angelika Berlejung of Leipzig University. 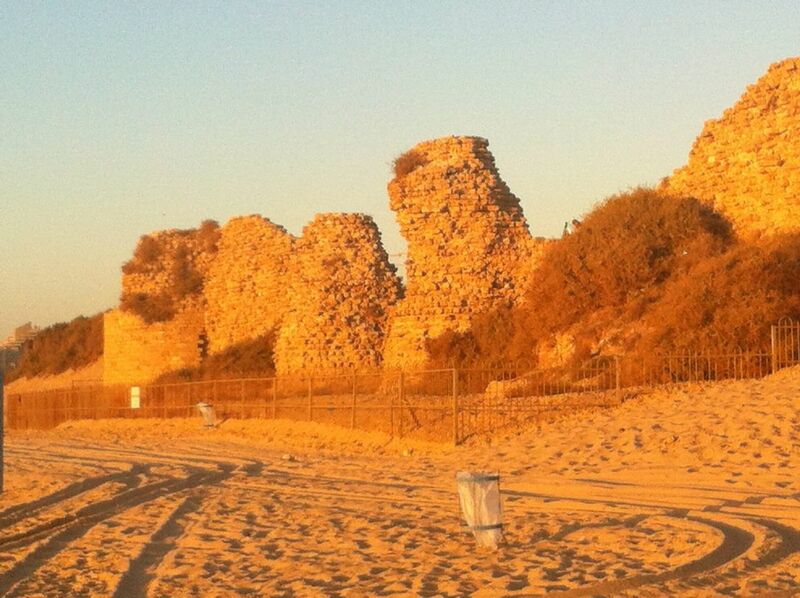 "Obviously, the ruins of the Roman-Byzantine city of Ashdod-Yam are waiting beneath the dunes,” Fantalkin adds. 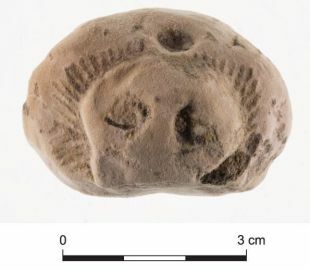 The unique inscription was discovered between two modern houses in Ashdod, about a mile from the coast (the sea level in Roman times was similar to present-day, but slightly higher in the Byzantine period, so the coastline may have been nearer then). Surprise at the discovery might be slightly mitigated by the fact that a corner of a colorful mosaic floor had been discernable in the ground at the site for the past 30 years, says Fantalkin. The city of Ashdod-Yam (not to be confused with the city of Ashdod) had existed for thousands of years. It was certainly occupied from the late Iron Age (eighth to seventh centuries B.C.E. ), and during the Hellenistic Period (323-31 B.C.E.). The archaeologists hope to find evidence of what happened when the Assyrians crushed next-door Ashdod and expanded Ashdod-Yam (which, in Hebrew, means "Ashdod by the Sea"; in Assyrian sources, the city was called Asdudimmu). 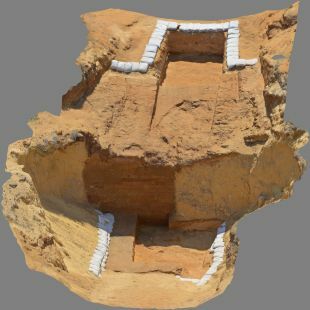 Meanwhile, the excavations have exposed an enormous system of fortifications from Iron Age Ashdod-Yam. Finds inside the fortified city this year include massive mud-brick structures and Assyrian-style pottery and various luxury items. “This season we had impressive mudbrick architecture inside the city, on the acropolis, from the Iron IIB period, and also remains from the Iron IIC. There were narrow corridors between Iron IIB mudbrick walls, with some exemplary finds on the floors: Assyrian style bowls, bronze eyes with inlays (probably from a wooden sculpture that did not survive) and a statuette of a lioness,” says Fantalkin. Ancient sources tell of the uprising by the king of Ashdod, Yamani, against the Assyrians. After the Ashdodites stopped paying Sargon II tribute, the Assyrian king dispatched a military force to crush the uprising. When King Yamani of Ashdod heard that Sargon's commander in Chief, Turtanu, marched against the city, he fled, tail between legs, to Egypt. Although the unsympathetic Egyptians later handed him back to the Assyrians, in fetters, the peeved Assyrians sacked the city of Ashdod in 712-711 B.C.E. With the Pax Assyriaca reinstated, sea trading could resume and tax could be levied, for the greater fortune of the Assyrian domain. Archaeologist Jacob Kaplan, who unearthed some of the Iron Age remains in the late 1960s, had assumed the fortifications were built by the rebel king in anticipation of the Assyrian onslaught. Today, the thinking is that the fortification was too impressive to have been built in haste. However, the question remains: Who was responsible for this construction? Was it commenced on behalf of the Assyrian regime from the beginning and constructed by the locals, in order to protect a man-made harbor? Or was it constructed first independently on behalf of the Kingdom of Ashdod and enlarged and incorporated later on into the Neo-Assyrian realm? Only future excavations will provide the answers. During this period of Assyrian dominance, Ashdod-Yam became one of the most important trading hubs of the Assyrian empire's eastern frontier. Somewhat more recent ruins from the Hellenistic period, including what seem to be the traces of the settlement of the Seleucid garrison captured by the Hasmonean king John Hyrcanus in the late second century B.C.E., were discovered on the acropolis during two previous excavation seasons. Ultimately, the Hellenistic city was struck by an earthquake and finally abandoned and ruined sometime in the late second century B.C.E. The real gem of this Ashdod-Yam exploration season came, however, from far beyond the limits of the Iron Age or Hellenistic compound. "[By the grace of God (or Christ)], this work was done from the foundation under Procopius, our most saintly and most holy bishop, in the month Dios of the 3rd indiction, year 292"
Lovely, but calculating the actual date of the inscription proved to be extraordinarily tricky. Attempts to establish well-known eras for calculation of the absolute date did not fit the indiction. (“Indiction” refers to an ancient method of keeping track of time for taxation purposes.) In antiquity, different local eras were used for chronological purposes. It is not always easy to correlate and establish an absolute date and the year mentioned in the inscription. Using a Georgian chronological system, Dr. Leah Di Segni of the Hebrew University suggests the inscription should be dated to 539. If she is right, it would prove her earlier suggestion that a Georgian chronological system, which also developed its own Georgian era of Creation, had been introduced in Palestine long before it came into use in Georgia itself (by which we mean the formerly Soviet country, not the American state). Jerusalem and its surroundings have several early Byzantine-era Georgian establishments. If the church being dedicated with this inscription was Georgian, it would be the first example on the Israeli coast. “Perhaps the structure was erected in memory of the famous Peter the Iberian, a Georgian royal prince by birth, who became a prominent figure of early Christianity, actively promoting monophysitism that rejected the Council of Chalcedon," Fantalkin speculates (meaning, Peter promoted the view that Jesus had only one, divine nature). "Perhaps Peter the Iberian, who stayed and preached at Ashdod-Yam shortly before his death, might have had an even greater influence than scholars previously thought in the area," suggests Dr. Balbina Bäbler of the University of Göttingen. An aerial photograph from the British Mandate period shows that, back then, there were significant remains in the vicinity of the inscription. According to Fantalkin and Sa'ar Ganor, Ashkelon district archaeologist at the IAA, it is plausible that the whole complex is represented on the famous sixth century Madaba Mosaic Map, which is located in the Byzantine church of Saint George at Madaba, Jordan. 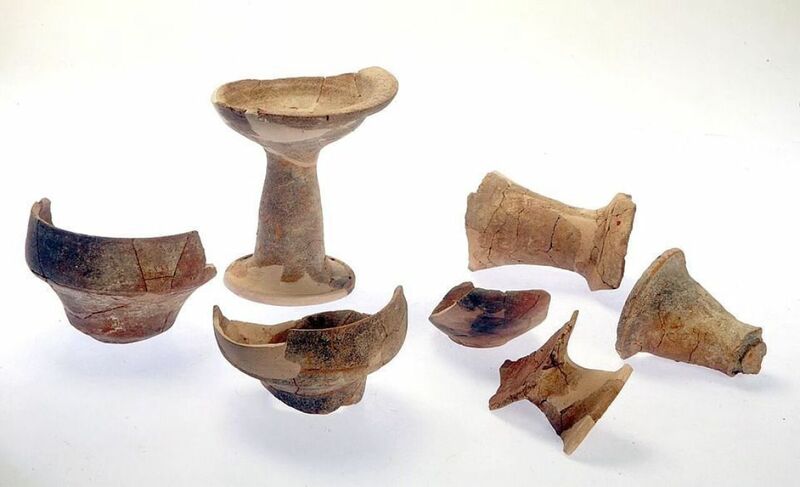 The archaeologists hope that further investigation of the complex will shed more light on the roles of Ashdod and Ashdod-Yam in the history of early Christianity. "Philip, however, appeared at Azotos and traveled about, preaching the gospel in all the towns until he reached Caesarea." (Acts 8:40). Indeed, we should know more if Ganor is right. 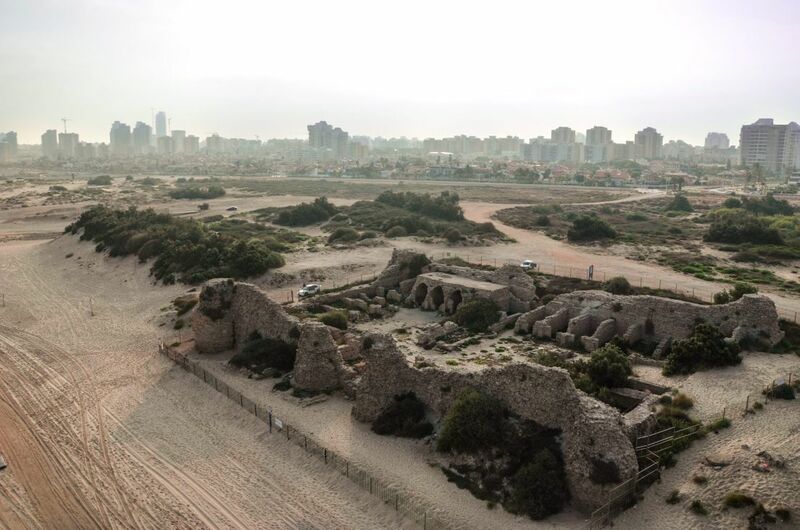 He thinks that, based on the archaeological record and history, spectacular remains of the Roman-Byzantine city of Ashdod-Yam await discovery beneath the sand dunes.